It’s been a long wait, but the day is finally here. It’s time for @JimiHendrix to set Rocksmith 2014 on fire! Happy Hendrix Day! #rocksmith2014 DLC. It’s some of the hardest and most rewarding dlc we’ve ever released. That chap was quite good eh!? Today’s DLC is available as a 12 Pack ($29.99), Four 3 Packs ($7.99 each), or 12 Singles ($2.99 per song). If you purchased Rocksmith 2014 for either Xbox One or Playstation 4, you will receive the 12 songs for free! Just make sure you download them before January 31st, 2015 or you’ll have to pay for them. Songs not denoted by a specific tuning are E Standard on all arrangements. A note to our YouTube followers, we will most likely not be uploading any videos of @JimiHendrix, as @elisoncrz and our rhythm game community at large has a history with The Hendrix Estate flagging channels with copyright strikes. Instead we will be posting the videos via Facebook and will make sure you folks are able to watch them easily via this article. Are you ready for the experience? Will Jimi Hendrix be your vote for best DLC of December (or maybe even 2014). Let us know in the comments below. Can anyone tell me how this works for next gen? I bought the pack this week but decided to get an X-Box One for Christmas. So, if I buy Rocksmith now, I have the pack twice. Is it a code that I can sell? Maybe even to PlayStation 4-Users? Am I the only one who bought the Hendrix Song Pack I and got the IV? They are looking into that issue. Today, Hendrix finally hit the Xbox One and, for the first time since I last caught caught myself in my zipper, I openly wept. Stevie Ray Vaughan’s rendition of “Little Wing” is the reason I picked up a guitar.To me, it is one of the finest instrumentals ever recorded, simple, elegant and full of passion. Imagine the joy I felt knowing that I was about to play a version of this wonderful piece of music. I did not weep as I played, I did not weep because my hands would not obey me. I wept when barely two minutes into the track, the credits rolled. The track didn’t end, it just faded out. I was so close… Please for the love of music, bring the Stevie Ray Vaughan version to Rocksmith. No one likes to see a grown man cry. Couldn’t agree more. The SRV version is the best interpretation of that song hands down. I feel it’s even better than the original, but hey, that’s just me. I really hope this opens the door for SRVs Little Wing. That’s how it was recorded. I know, it’s very short… the live versions are better really. But it’s still awesome. So this is the last DLC for 2014? Steam currently has 50% off all singles again and 66% off the game (16.98USD) for the “Winter” Sale. 25% off packs. Get in quick PC chosen ones. Now im getting upset. I still cannot download any of my packs from 360 to one, only some individual songs from the packs. And now jimmi wont even appear in the store. Can anyone enloghten me? how can I watch the guitar videos? it keeps saying me “this video is private’..
Do you think you’ll find someone to upload these videos so you can link them here? Up to @elisoncrz but we’ll find some video previews otherwise. I think someone (else) needs to stage a hunger strike in front of Ubisoft and Microsoft headquarters. Who is this Jimi guy everyone keeps talking bout? He has the skill level of kindergartener playing a tambourine. Just a bunch of power chords! So went to bed last night at 11pm with no pack central time. I haven’t bothered checking yet today, but now that I am unavailable it’s most likely there now. What time does the UK PSN store update? All singles comes to $36, all packs comes to $32, the 12-pack comes as $30, for all you penny-pinchers. As for me? I’ll probably pick up a pack or two, as my Xbox Credit only has $20 in it as if now… I honestly can’t wait, I’m buying what I can NOW. Got to agree with a few others. Would drop “If 6 was 9 ” and “Freedom” in favor of “Hey Joe” and “All Along the Watchtower”. Not sure how easy the legal issues would be for that Dylan song though. Am I being greedy? I think it’s time for the children of Hendrix: Fruiscante (RHCP), Mayer, Garza (LLB), and the “It’s About Freakin Time HOF Inductee” SRV. Need to see their grandfathers as well, Buddy Guy, and some more Albert King. I too was sad not to see All Along the Watchtower. Soooo poo effffin pumped. Gg all! All content is up on PSN US! Still no access on XBOX One. Did I miss something? Just got home and checked (almost 7pm now) and it’s not up. Way to go Ubi… I still have yet to even get the packs I bought on the 360 as well as the RS1 import. They’ve been dropping the ball for a while if you ask me. Rippa Rita. I’m down for the lot. Keep ’em comin’ lads. Don’t doubt that this is the best game ever. Those last holdouts should be clamouring to have their songs on here. Eb437, Eb431 -- that’s pretty weird. I was not aware that he would tune like this. He musta tuned ’em by ear or they just adjusted the speed of the recording slightly when they were producing his albums. Anyway, cool thing to know. Actually Tom Morello’s tied with Hendrix. 7 RATM + 5 Audioslave = 12. Actually Dave Grohl wins : 11 Foo Fighters + 1 Them Crooked Vulvures + 1 Queens of the Stone Age + 3 Nirvana = 16! I think a pack like this is huge and critical to the success of the game. I want several songs but the others, not sure. I’ll end up buying the entire lot, no doubt. I would’ve appreciated the ability to watch the play videos on YouTube--I don’t use facespace or whatever. You don’t have to use facebook as the videos will be embedded here. Oh, sweet, I must’ve misread. So the Hendrix DLC isn’t available on PS4 until the 17th? Not the 16th as advertised? How frustrating. No, it says it will be available outside of North America on the 17th. That’s not really up to Ubisoft it’s up to Sony on when they update their marketplace. Thanks Elliot, but I couldn’t find that info anywhere. Where did you find it? Darkmax77, you are entitled to your opinion. Just know that it makes you sound like you do your homework with crayons. Everybody else, high five! Is it available in the UK yet on PSN, seriously poor delays by Sony? Thanks Elliot, fingers and toes crossed. Maybe RATM will appear one day. The middle of January is a scenario, that you might as well prepare for. Would trade Freedom for Hey Joe or Spanish Castle Magic. The Olympic White Strat comes out for this. 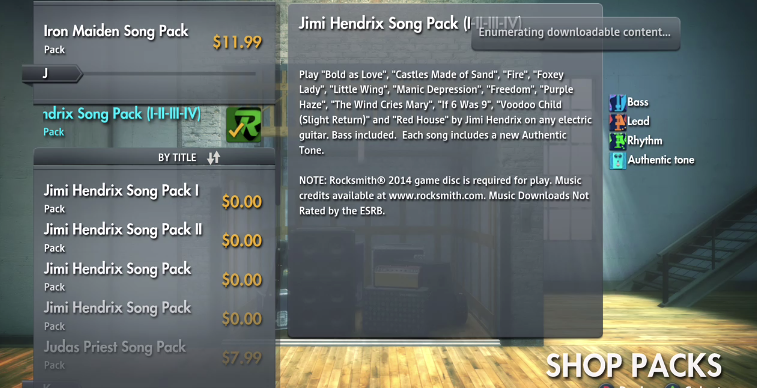 Don’t know if I will buy this DLC…I’m not at all a fan of Jimi Hendrix (I pretty much dislike him). And if I can’t upload videos on Youtube, it’ll be useless. You will probably enjoy the basslines, also I’m sure you could upload the videos to YouTube, we just don’t want to risk it. Because if I can’t show off on YouTube, then nothing is worth playing! Best dlc in the history of the intergalactic planetary alliance of rad-cool people! Strap it on and blast it, my homies!